Whether you’re having a lunch break from work with your pals, or you want to spend a magical evening in the lit-up city, London is home to a large array of high-quality beer gardens. No matter what you look for in a beer garden, it’s highly likely that London will have it. From sparkling fairy lights to respectful memorial benches, each beer garden has its own character. If you’re unsure about which one to visit on your next London outing, never fear! We have you covered. Particularly at night time, pubs can be a rowdy place filled with more-than tipsy millennials and loud, obnoxious music. Visiting Canonbury’s beer garden will provide you with a completely different experience, though. Don’t come here expecting to find a period pub, because Canonbury’s beer garden is completely walled-off, encircling a modern lounge filled with comfortable designer sofas with intricate weave detailing. Plus, the bar is located right outside, so you don’t need to leave the sophisticated ambiance behind when fetching yourself a drink. Feeling a little peckish? Canonbury’s beer garden has a range of tasty nibbles on offer, all the way up to huge burgers, catering for even the largest of appetites. For some people, visiting London can be quite the novelty, so it might be at the top of your priority list to find a beer garden that’s unique and bespoke. With a lively community, the Magic Garden Pub has no shortage of illuminations, with lit up bench tables and a staple car centrepiece covered in eccentric, vibrant detailing. If jamming out is on your list, this beer garden has nightly music sessions, which you can enjoy whilst sipping on some of the finest cocktails that London has to offer. In addition, we all know that British weather is completely unpredictable, and can often ruin your outdoor excursions – but not at the Magic Garden Pub! The garden is partially covered, so you can shield yourself from the rain. We’ve all seen a run-down, unprofessional beer garden, riddled with weeds poking up out of the poorly slabbed pavement. The Dolphin is quite possibly the opposite of this image. 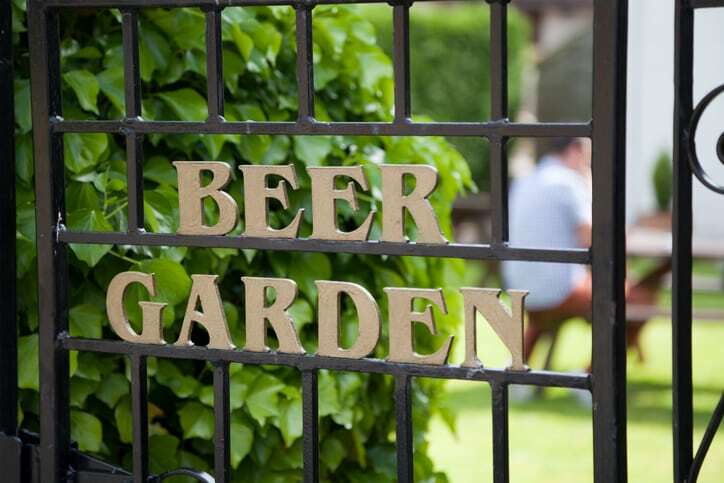 Instead, this beer garden situated in the south of London is something of a masterpiece, with hedges taking a circular effect around the outdoor furniture, giving the beer garden an Alice in Wonderland vibe. If you’ve had a particularly hard day and want to seclude yourself, there are plenty of tucked away corners so you can enjoy your own company. Or, if romance is on the cards, this beer garden would be the perfect place to take your date to! Conventional pubs really can become quite the bore, especially when visiting them day after day. The Express Tavern beer garden couldn’t get further away from the traditional pub, with not a jukebox, fruit machine or pool table in sight throughout the entire proximity. Instead, this is a highly sophisticated destination, with stunning views of an emerald green lawn and shimmering lakes. Unfortunately, you aren’t able to stand on the lawn due to its bowling history; however even just looking at it is enough to brighten your spirits.